The Solomon Schechter School of Queens is situated in Flushing, New York in the borough of Queens County. The four story brick structure on 76th Road and Parsons Boulevard opened in 1965 and houses the First through Eighth Grade students. In addition a separate wing on the property, houses the Pre-K and Kindergarten students. A fenced in yard with age appropriate playground equipment, and basketball courts surrounds the structure. Schedule a visit and see what we have to offer. Subway IND line, E or F to Kew Gardens Union Turnpike/Queens Boulevard. Transfers are available for Q10/Q10A (to JFK Airport), Q37, Q46 and Q74. Take the Q46 Bus to Parsons Blvd. Turn left on to Parsons Blvd. And walk about 6 blocks (numbers of streets should be going down to 76th Road). NORTH: Throgs Neck Bridge, Clearview Expressway, Exit 3, 73rd Avenue. 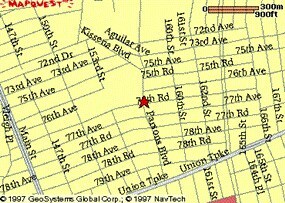 Right on 73rd Avenue to Parsons Blvd. Left onto Parsons Blvd. to 76th Road. Whitestone Bridge to Van Wyck Expressway, Exit - Jewel Avenue 69th Road. At end of exit ramp turn left onto Jewel Avenue. 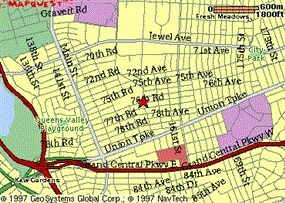 Continue up Jewel Avenue to Kissena Blvd. Right on Kissena Blvd. (it will change to Parsons Blvd. at 75th Avenue) to 76th Road. Right on to 76th Road. SOUTH: Verrazano Bridge (Brooklyn exit) to Belt Parkway, Van Wyck (North) to Jewel Avenue. Straight to Kissena Blvd., turn right (it will change to Parsons Blvd. at 75th Avenue) to 76th Road. Right on to 76th Road. MANHATTAN: Grand Central Parkway to Parsons Blvd. exit. Left turn (over parkway) to 76th Road. Make a left turn. Long Island Expressway East to Kissena Blvd. exit. Turn right on Kissena Blvd. (it will change to Parsons Blvd. at 75th Avenue) to 76th Road. Right on to 76th Road. LONG ISLAND: Long Island Expressway West to Kissena Blvd. exit. Left on Kissena Blvd. (it will change to Parsons Blvd. at 75th Avenue) to 76th Road. Right on to 76th Road. Grand Central Parkway West to 168th Street Exit. Ride service road to Parsons Blvd. Make a right turn. Continue to 76th Road. Make a left turn.